What a night at Benham Gallery in Seattle. Mac Holbert of Nash Editions has a show up and was there to talk about digital printing. He is also in town for the Epson Print Academy seminar tomorrow (Saturday). 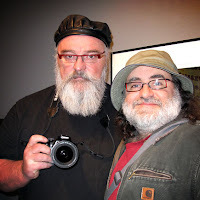 So along with Mac, a few other luminaries showed up this evening: Jeff Schewe, Greg Gorman, JP Caponigro, Andrew Rodney, Jack Reznicki (who I have not seen since I had a studio in NYC around 1983), John Shaw, print longevity expert Henry Willhelm, and probably a few more who I can't think of at the moment. 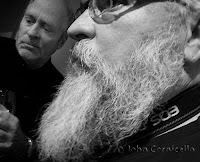 Above is a photo of Jeff Schewe and me, taken by Jeff's wife. At the top is a photo of Jeff and Greg Gorman. Looking forward to the Epson Print Academy.